The project to retrofit the Shell Canada Energy Building into a fabrication facility presented Eskimo Steel Ltd's design-build team with unique challenges, requiring creative design and installation solutions. Their achievements were recognized recently through a category win at the CISC Alberta Awards 2011, with the benefits our software suite acknowledged to be integral to the success of the project. 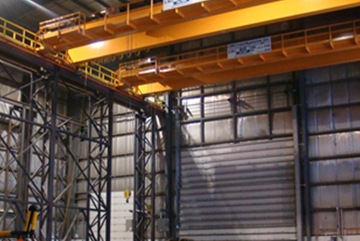 Eskimo Steel Ltd was awarded the contract for detailing, fabrication, installation, testing and commissioning of crane support structures and four overhead cranes as part of the retrofit project. As long term users of our software solutions and early adopters of the STRUMIS fabrication management system, Eskimo Steel Ltd have ensured maximum competitive advantages across their fabrication delivery process. "We had to do considerable design up front in order to bid," says Brian Watson, President of Eskimo Steel Ltd. and project manager. "Keeping the amount of relocation of existing structural members and mechanical and electrical equipment to a minimum was critical. Early in the process, the design team undertook a site survey and entered the data into 3D Detailing software." "One of the early challenges was the special requirement to absolutely maximize the area of travel of the overhead cranes," Mr Watson says. "It was akin to trying to stretch a cube in three dimensions without touching the perimeter." The team's solution was a series of three-dimensional tower columns made of HSS and recessed between the existing pre-engineered building columns. The towers support not only the gravity loads but also the lateral loads imposed by the cranes, eliminating the need for horizontal trusses and maximizing overhead crane span and lateral hook travel. Scheduling was also a major challenge on the project. "The timeline was tight between the awarding of the bid to commissioning of the cranes," Mr Watson says. "This meant we had to work as a team, share information and get approvals quickly at each step." "I think the collaboration enabled by StruWalker (now BIMReview) and the thought given to identifying problems before they arose and identifying solutions made the project flow tremendously from start to finish," Mr Watson adds. "Fabrication of components throughout the project was also greatly enabled by the use of the STRUMIS system, which optimized the procurement and production process and assisted scheduling greatly." ESKIMO STEEL LTD. (established in 1972) is a full service structural steel fabricator and erector, specializing in the industrial markets of Alberta and the Northwest Territories. With a customer driven loyal and highly skilled staff, Eskimo focuses on performance, safety, quality, and efficiency. To remain competitive both now and in the future, Eskimo has invested in its facility, equipment, and technology. With over 20,000 square feet, 4 overhead cranes, 450' of crane way, and a 24' hook height, Eskimo is capable of taking on a variety of work.